The theme of this work is gin and the negative effects it has when consumed in high quantities as opposed to the 'healthy' consumption of much weaker English beer which was believed to cause less social problems. In Beer Street happy and healthy drinkers celebrate the king's birthday after a hard day's work. Business on the street is thriving apart from the pawnbroker who hides from debt collectors. On Gin Lane however, there is a shocking deterioration of morals; the street is in a state of ill repair and the people are almost skeletal and disheveled. People are pleading with the pawnbroker to buy their wares in order to find more money for gin and a neglectful mother lets her child fall to its death. If Hogarth was encouraged to produce these prints by his friend Henry Fielding they certainly continue in the same vain as many other works that he produced around this time. 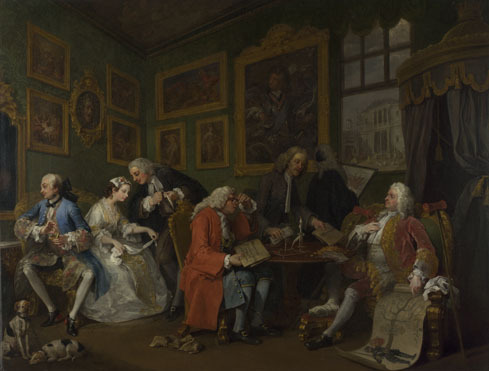 Unlike many of his earlier moral works, such as Marriage a la Mode which satirized the foibles of the upper classes in a gentle manner, Hogarth's later offerings became stark social warnings. 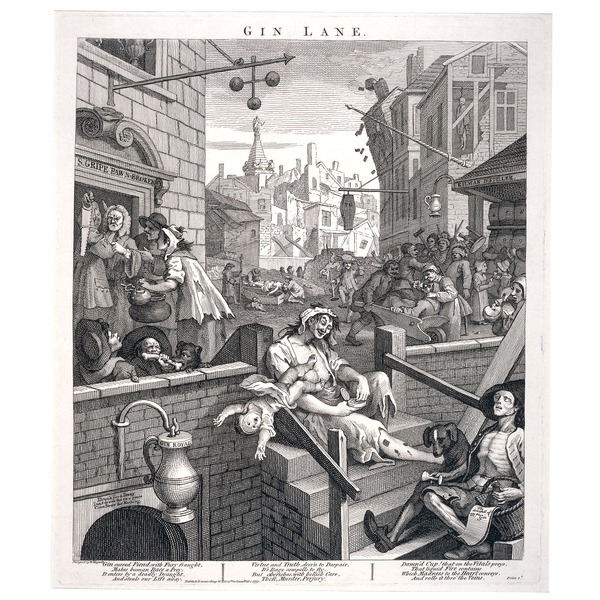 Prints such as Beer Street and Gin Lane were designed to highlight the problems relating to drinking gin and to encourage the viewer to choose beer instead. 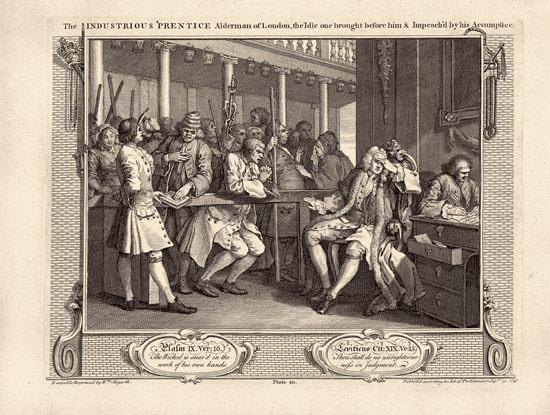 Not only was beer much weaker, but it was also produced locally and in many ways Hogarth uses it to promote a kind of national unity within this picture. The consumption of large amounts of gin was a real problem in 18th century England. It had been introduced when Queen Anne married King George of Denmark and gin began to replace local beers as the drink of choice for the lower-class population. 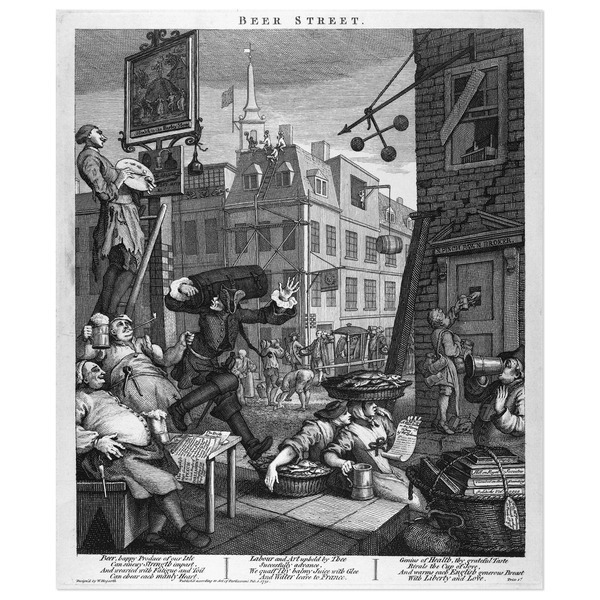 In comparison, Beer Street was an image demonstrating Hogarth's pride in his country and shows an idyllic image of England without foreign influences. 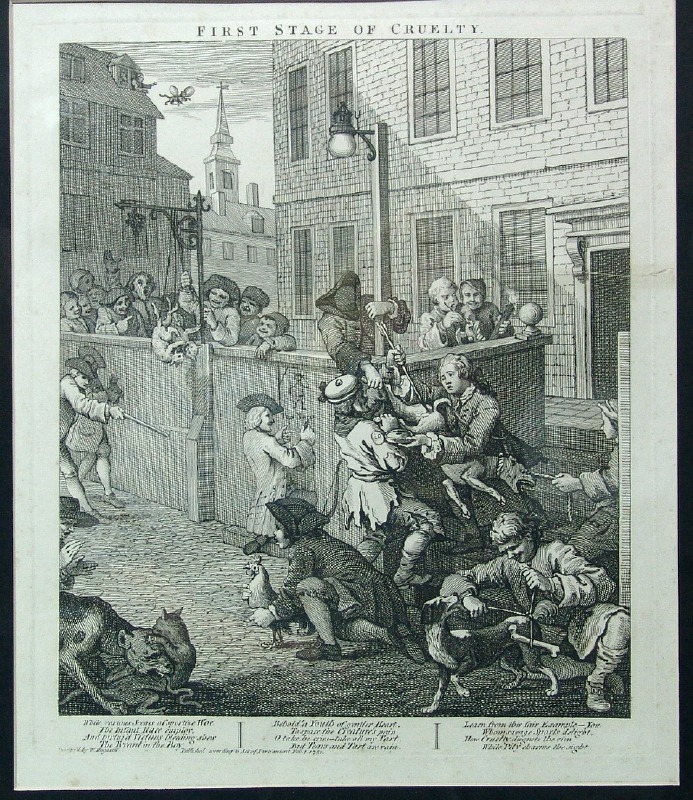 Having already produced some moral works in the early 1730s Hogarth returned to the genre with Beer Street and Gin Lane among other prints. His Presbyterian upbringing and strong moral code meant that he was keen to use art as a way that would shock the general public into action, concerning the vices and addictions that he felt were ruining English society. 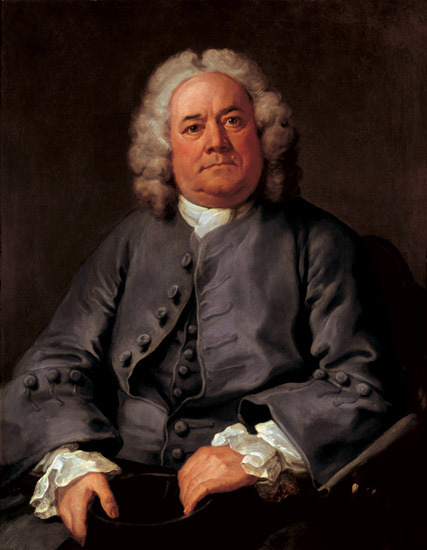 Hogarth was good friends with the writer and magistrate Henry Fielding. Fielding, had to deal with the massive crime wave during this period which he put down to the large consumption of gin by the lower classes in the area. Fielding published 'Gin: an inquiry into the late increase in robbers' in 1751, shortly before Hogarth published Beer Street and Gin Lane. It's believed he enlisted Hogarth to produce these prints in order to gain more support for the 'Gin Act' which he was attempting to put through Parliament, limiting the selling of gin to licensed establishments. 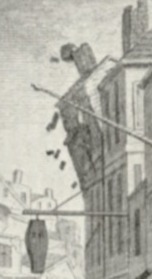 Hogarth based Gin Lane on an area of London called St. Giles. In describing this are the artist commented:"Nothing but idleness, poverty, misery and ruin are to be seen." 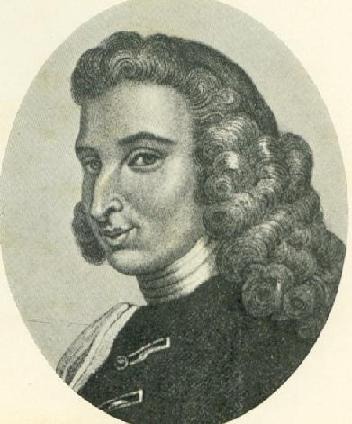 In 1734 Dufour was arrested and tried for the murder of her own child. She retrieved her baby daughter from the workhouse, where she had been given new clothes, only to strangle her and leave her body in a ditch. She then sold the baby's clothes for gin money. This story understandably shocked Hogarth and images of neglectful mothers can be seen throughout Gin Lane. Gin was so widely available in London in the middle part of the 18th century it's believed that in areas such as St. Giles, a quarter of all residences sold gin. 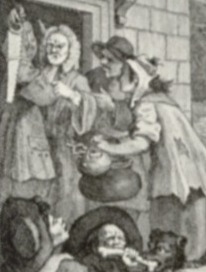 Hogarth uses many of the signs that are part of the image to help direct the viewer's gaze to the various other sub-narratives that appear in the image. In Beer Street he uses the signature S-curve technique in his painting as well as using it in other forms in a more angular way for the poles on the distant building. They also help direct the eyes across the busy scene. The Beer Street is print is generally calmer than Gin Lane, making the scene much easier to view and certainly more pleasurable to look at, a reflection on the themes within it. Hogarth has used various planes on which to view this tumultuous piece allowing him to include more drama and action without jeopardizing its three-dimensional aspects. He has the post signs and arrows in the image to blatantly point to the various happenings in the work. His shading effects also help highlight the various visuals. 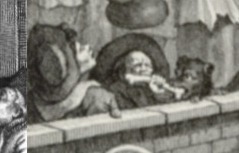 In Gin Lane Hogarth shows a pawnbroker Mr. Pinch, his building in ruins as he sells his wares through a hole in the door. Evidently he is hiding from debt collectors so he makes money selling beer; he even has a little mousetrap at his window most likely symbolizing his 'trapped' situation. Hogarth is presumably showing that even the lowest members of society can be redeemed if they convert to a good moral code. In Beer Street a flag is being hoisted in the background and critics have identified this as being part of the celebrations for the birthday of King George II. Hogarth is showing the viewer that prosperous people have the means to celebrate when it's appropriate, and that such people support King and country. Hogarth made two engravings for this work and then had them repeatedly printed in newspapers and books so that they got as much coverage as possible. 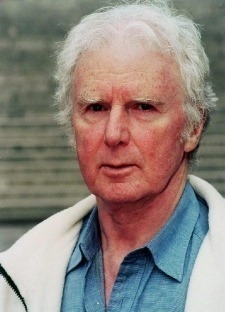 The modern art critic Brian Sewell found Hogarth's moral work to be overly-dramatic and derived from anger rather than reason: "All this may seem admirable but it was flawed by Hogarth's heavy-handedness, the downright condemnation that was his blunt response to every social problem." A well-known critic and essay writer, Lamb was a fan of Hogarth's work and wrote an essay, 'The Genius and character of Hogarth' in 1811. In this he picks out Gin Lane as one of his favorite works and describes it as: "A sublime print... every part is full of strange images of death; it is perfectly amazing and astounding to look at." However, Lamb himself was not always a reliable critic and his biographer Alfred Ainger, noted that from his essay, Lamb undoubtedly did not have the prints in front of him when he was writing, as he mentioned characters which do not appear in the scene. Dickens echoed Hogarth's observations about gin and the poor in his 1836 work 'Sketches by Boz'. 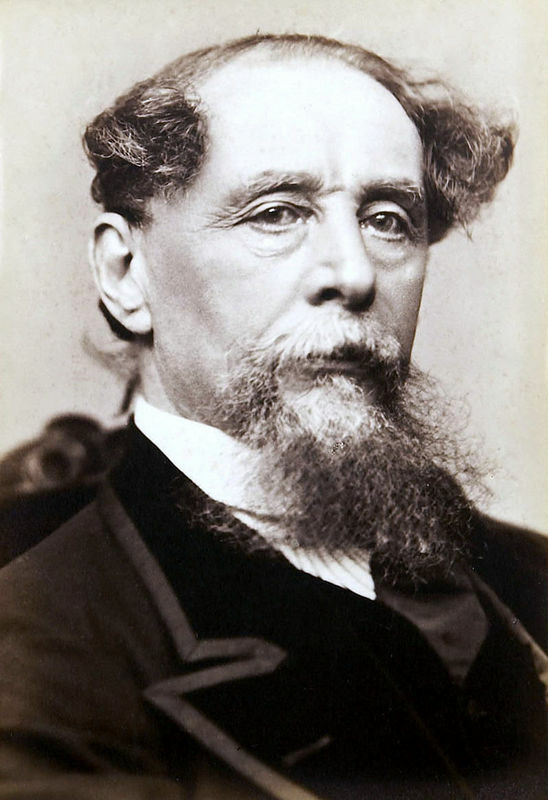 Like Hogarth, Dickens made the point that poverty rather than gin itself was the cause of many of London's social problems: "Gin-drinking is a great vice in England, but wretchedness and dirt are a greater; and until you improve the homes of the poor, or persuade a half-famished wretch not to seek relief in the temporary oblivion of his own misery ... gin-shops will increase in number and splendour." With no official records of sales available it's difficult to gauge how well Beer Street and Gin Lane was received by the public in Hogarth's time. It was sold at one shilling per print, which would have taken it out of the reach of the poorer people within London. Certainly those who were heavily reliant on gin would not have been able to afford the prints. It's more likely that people from the middle and upper classes would have bought the prints and been shocked by them, lending support to Fielding's Gin Act. There is some evidence to suggest that these pieces were used for educational purposes within schools to discourage the use of alcohol. Hogarth produced many works which reflected the corrupt morality of English society. Where his earlier pieces tended to pick out the foibles of the rich and naïve, his later works such as Beer Street and Gin Lane, portray much darker themes. Below are some similar works Hogarth produced around the same time. This series shows the story of two apprentices who start training at the same time. One works hard and lives a good life, the other works little and descends into a life of debt, prostitution and gambling. As with Beer Street and Gin lane Hogarth uses opposing stories or scenes to throw his most shocking images into sharp relief. In the Four Stages of Cruelty Hogarth depicts the life of a fictional character named Tom Nero. He shows how cruelty at a young age can descend into murder and horror and eventually the perpetrator being hanged for his crimes, his body used for surgical demonstrations. In these images Hogarth depicts savagery and mutilation and this was supposed to provide moral instruction to the viewer and underline Hogarth's horror about the acts of cruelty which he witnessed on the streets of London. 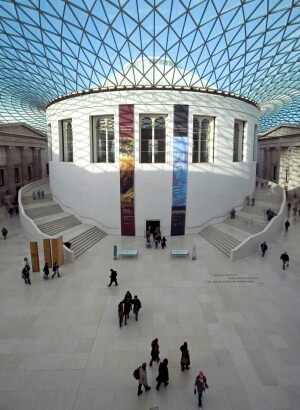 Due to the nature of the prints produced and the large number sold in the 18th century, several galleries, museums and private collectors have copies of Beer Street and Gin Lane including The British Museum and Tate Britain, London. Hogarth owned the plates from which the copies of Beer Street and Gin Lane were produced until his death in 1758. As he left no children they were then sold on with the rest of his possessions. There were never any original paintings of these pieces to be sold or survive today. Due to the nature of prints and the fact that many of them are produced at one time, a copy of Beer Street or Gin lane is not likely to be sold for a large amount of money. Hogarth originally advertised for them to be sold at 1 shilling each, with larger copies at 1s 6d. Rare copies and first drafts of both Beer Street and Gin Lane have been known to fetch more money. Hogarth produced Beer Street and Gin Lane in 1740, when he was already well established as an artist. 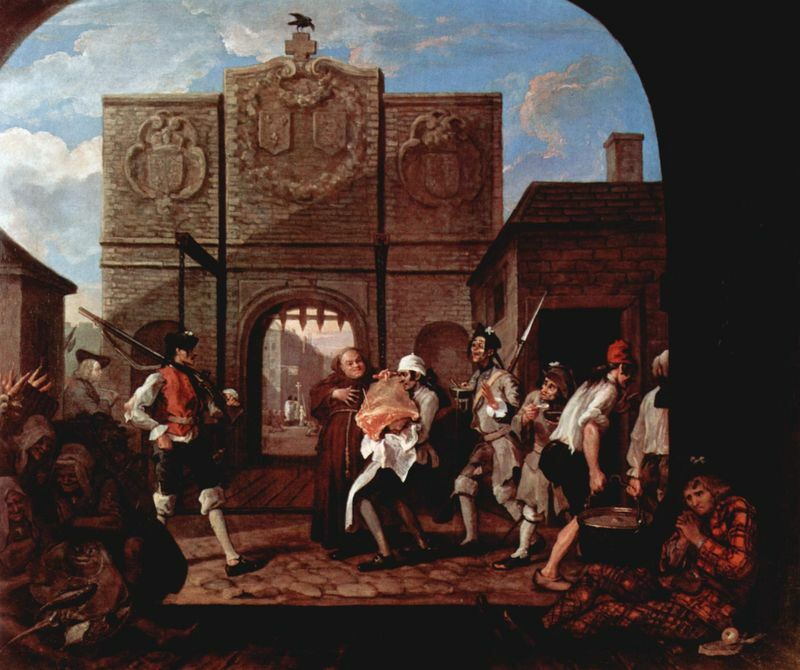 Part of his second wave of 'morality paintings' the set was created to highlight the problems related to the consumption of gin which affected a large part of London society at the time. 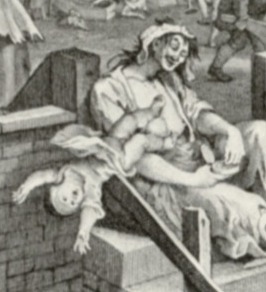 These later moral works were generally a lot darker and more frightening then Hogarth's earlier works and this may reflect his worry for future generations. The artist was heavily influenced by 18th century life, culture and his middle-class upbringing. He believed that art should have moral as well as aesthetic qualities and tried to bring this into all of the work he produced. 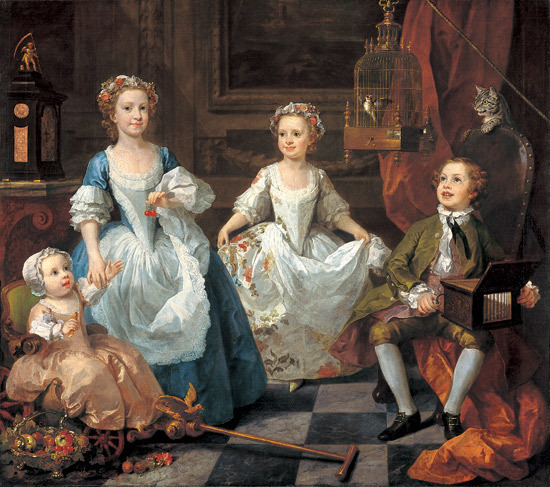 Having lived in debtors' lodging for five years as a very young boy, Hogarth had seen the harder side of life and brought a sense of gritty realism to all his paintings. What he believed to be the deterioration of British morals particularly concerned him and his satirical engravings illustrate his concerns for his fellow countrymen. As Hogarth became a prominent figure in the London art scene he was influenced by a number of things. These included politics, art, literature and the theatre. William Hogarth will be remembered as the father of satirical caricatures and moral paintings, a genre which would later develop into cartoons. His determination and stout middle-class values made him one of the most innovative artists of his generation and he brought art to the common man for the first time in history. Rather than be influenced by many of the artists who had gone before him, Hogarth, a true innovator, tried to create a new school of English painting to rival the Old Masters of the Renaissance. In fact, rather than be influenced by their work it has been suggested that he often ridiculed them. 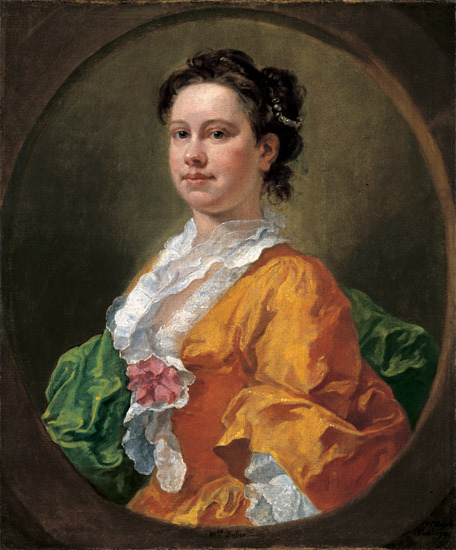 Far from being a positive influence, this style of painting pushed Hogarth to produce work of a completely different genre. Although Hogarth was a skilled portrait painter he became famous for his engravings which were sold in large numbers to people who would not have been able to previously afford art. His series of moral paintings, such as A Harlot's Progress and A Rake's Progress took a satirical look at the government and social scene of the day, and highlighted the best and worst parts of English culture. For further reading about William Hogarth please choose from the following recommended sources.